Comparing a hybrid vehicle to an electric vehicle isn’t the easiest comparison to make. There are a lot of advantages to getting a hybrid vehicle like the Ioniq Hybrid over an electric vehicle, like range for instance, but there are also several advantages to all-electric vehicles like the Nissan Leaf as well, like not spending money at the pump. 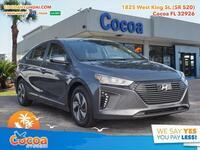 We thought we’d take a stab at this comparison by pitting the 2018 Hyundai Ioniq Hybrid vs 2018 Nissan Leaf to show you the differences between them and where one might have an advantage over the other. 26.5 cu. ft. Cargo Capacity 23.6 cu. ft. The table above shines a light on a few of the most important aspects of these two vehicles to give you the specifics of what each has to offer. We’ll work our way through the table, analyzing each spec to show you why it’s important and what it means for the vehicle in question, starting at the top with range. Range is important regardless of vehicle segment or type, but normally we don’t take it into consideration. Electric vehicles have understandably shorter ranges than gasoline or hybrid vehicles, which is why it becomes a more important thing to consider. As you can see from the top row of the table, the Ioniq Hybrid has a range of 500 miles more than the Nissan Leaf. A range like that is only ever going to come into play if you’re taking a long road trip, but if you travel a lot on a daily basis for work or whatever else you do during the day, it’s important to note that you can only travel 150 miles on a charge in the Leaf. If your daily travels total more than that, then the Leaf might not be the vehicle for you as you’ll have to constantly make sure you can charge it throughout the day. Range is the most important spec in the table, but we did look at a few more. For instance, fuel efficiency. 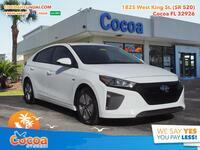 The Ioniq Hybrid has an incredible economy rating at 55 miles per gallon combined, but the Leaf doesn’t need fuel so its MPG equivalent is over 124 miles. Surprisingly, the Leaf does offer more horsepower than the Ioniq Hybrid but only by 8 HP. 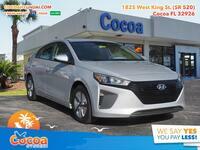 Finally, the Ioniq Hybrid does offer an extra 2.9 cu. ft. of space in its cargo hold. 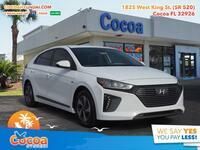 If you’re interested in a 2018 Hyundai Ioniq Hybrid, be sure to schedule a test drive right here on our website or by giving us a call at the sales desk. We look forward to getting you behind the wheel of one of these great hybrid sedans!